The game of this week is The Big Pro Wrestling!. You might be thinking why I am using Tag Team Wrestling marquee and flyer. It will become clear very soon. The Big Pro Wrestling! was developed by Technos Japan and released in 1983. 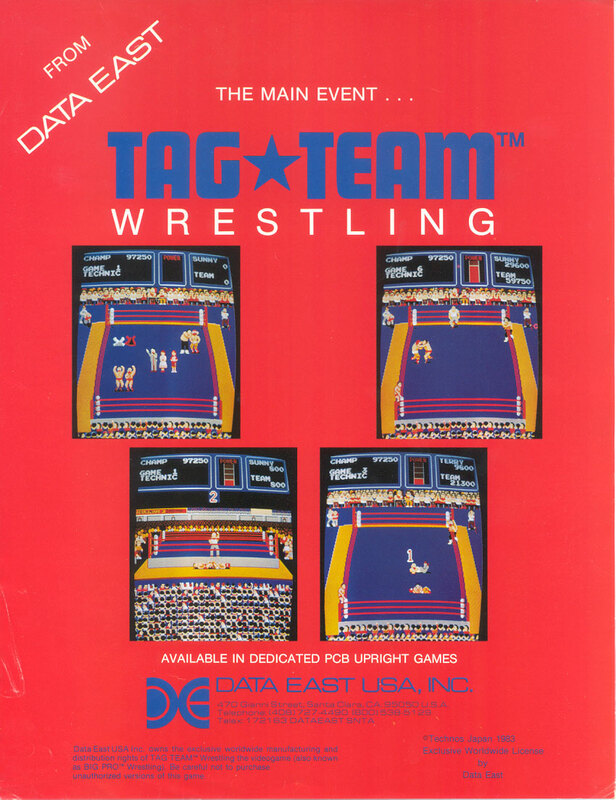 The game was published in the US by Data East with the name Tag Team Wrestling. You play as a professional wrestling tag-team, Sunny and Terry (Spike & Jocko in the US). In which you compete against the Heel Team (Mad Maulers in the US) for the tag team title. Both Sunny and Terry have the same moves list to select from. The moves are Nutter, Kick, Straight Jab, Karate Chop, Drop Kick, Body Slam, Rabbit Killer, Pile Driver, W - Lariat, Brain Buster, Rear Drop & Cobra Twist. The last four move are unable to be used against the opponent wearing black. You have a power bar at the top of the screen which lowers each time you are hit or perform a move. If your power bar reaches the bottom and you become pinned you will be unable to recover and lose the match. To recover your power you tag you team mate and he will recover power as he watches from the side.